I give Mr. Prevention grief sometimes about not swooning over every meal I serve up. Too many veggies this…it needs more salt that. Obviously we all have our likes and dislikes. Unfortunately for me, I have very few dislikes. Polenta is a food I have very little experience with, but I’ve always seen it in the grocery stores in those fun tubes that are shelf-stable. It’s so healthy and I pictured it being like tofu in having the ability to take on the flavors of whatever it’s being served with. The later may be true, but I love tofu and sadly, I have learned that I do not like polenta. At least not polenta that has been sliced from a log and pan-fried. Tasteless, horrid texture and blah. Into the trash it went. Sad, but true. The girl scout in me got to thinking how I could salvage this meal. It looked soooo good in Food Network Magazine. And the sauce…oh the sauce. It WAS delicious. Truly delicious. After far too many, “Ahahahahaha, I TOLD YOU POLENTA IS GROSS!” from Mr. Prevention, I boiled some farro and tossed it with the sausage and mushroom sauce. DELICIOUS. I swapped one Italian carb for another and not too shockingly, it was a winner. I guess it was a texture thing. I hate to be wrong, but polenta…you failed me. I want to love you, but I don’t. I’m just glad I didn’t throw my arms up completely at the meal and turned this into a new favorite Italian dish! Heat 1 quart water in a small pot; bring to a boil. Stir in the farro and cook ~20-25 minutes until tender, drain and set aside. Meanwhile, heat the oil in a skillet and add the sausage. Cook, stirring and breaking it up with a wooden spoon, until just browned, about 3 minutes. Add the mushrooms and cook, stirring occasionally, until they soften, about 3 minutes. Add the garlic and cook 1 minute. Stir in the tomatoes, 1/2 teaspoon salt and 1/4 teaspoon pepper and bring to a boil, breaking up the tomatoes with a spoon. Reduce the heat to medium low and simmer until slightly thickened, about 5 minutes. Stir in the parsley. 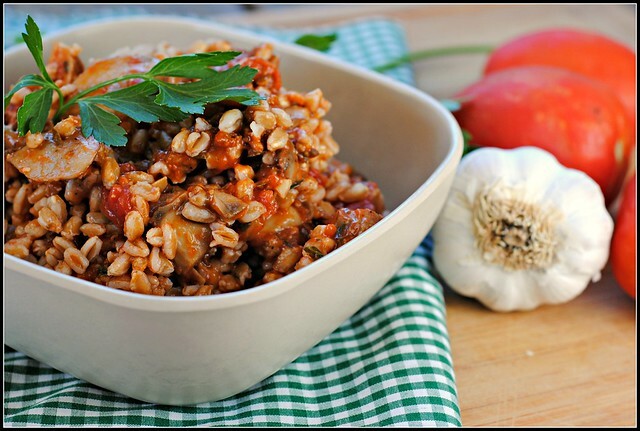 Simmer for 5-10 minutes and stir in cooked farro. Serve hot. Result: This sauce is DELICIOUS and would be good on anything, absolutely anything. 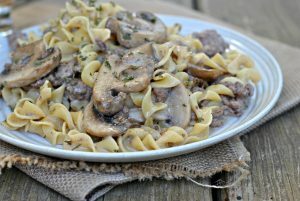 The hot Italian sausage with the mushrooms is the perfect texture variation. You can serve this over pasta or even rice. 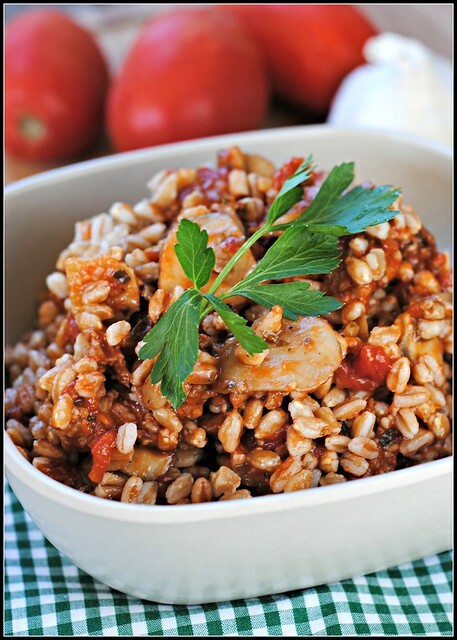 I opted for farro for little something different, but what you choose, rest assured, it will be delicious! Enjoy! I made the polenta (step 2 only) and served it as a side with chicken. Don’t give up on polenta! Those logs are terrible and I threw it out too. I loooove the soupy polenta and cheese never hurts 🙂 I will definitely try the instant kind, thank you Kate! Log polenta is HORRID but Trader Joe’s frozen spinach and carrot polenta is a staple in our freezer, I love to add protein to the top. Oh, Nicole! You have got to make homemade polenta!!! It is so much better…so creamy and amazing. 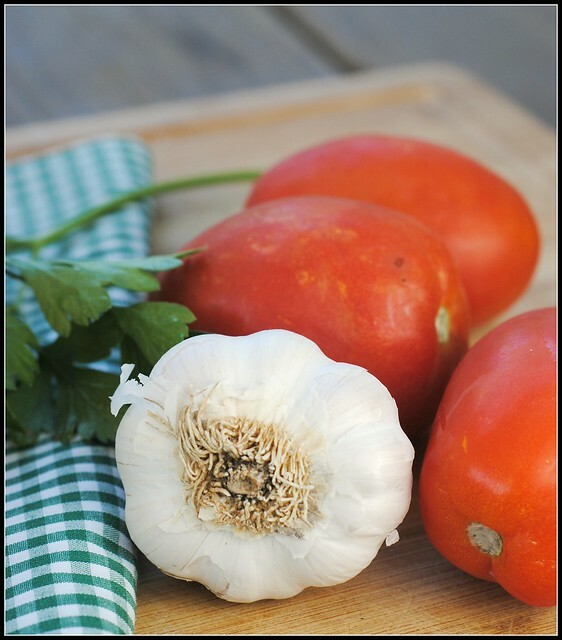 I love to serve it with a roasted tomato and caramelized onion sauce (although any marinara or meat sauce would work well) and with shrimp for an Italian style shrimp & “grits.” It is good with anything you would serve over pasta. Then, pour leftovers onto a greased sheet pan or 9×13 and allow to cool. Cut into shapes and “faux fry.” AMAZING with marinara. The log stuff is ok in a pinch…but you have to find the right brand. Some of them are just awful. Homemade is 100% better than the log. You can go creamy or you can do it so it sets up like the log in a pan. If you like grits, you’ll like the creamy version. 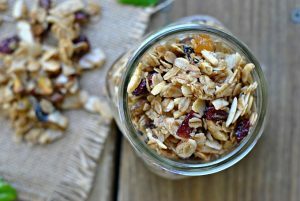 Farro is one grain I have yet to try. The ragout looks so comforting! I much prefer the creamy polenta that you make from a box – the tube stuff is a bit too rubbery for me. Glad the parents are here to help! Our temps won’t drop until Friday – love it! Hooray on the TWO GOALS! I think that’s a record for you in one game? I had tried making polenta once at home and didn’t care for it. I have had it in restaurants though and really enjoyed it. I definitely think it has potential but depends on the way it’s prepared. Great job on 2 goals!! 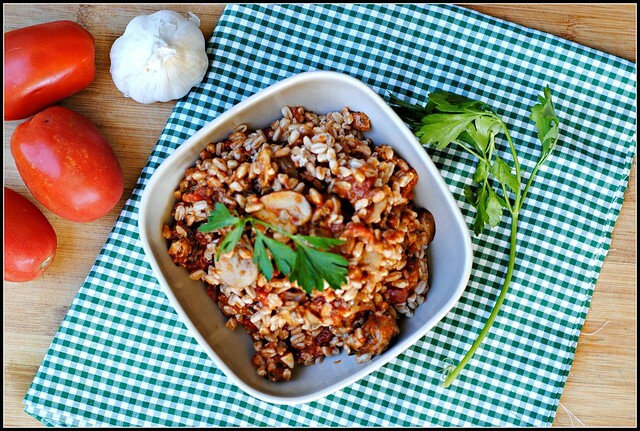 I’ve never tried cooking with Farro, but this looks like a great way to try it! Log of polenta is blech. You need to make yellow corn grits — which is basically what polenta is. You can make with cheeses and other veggies, add a little shrimp. It does harden a little as it cools, but normally you’ve eaten it by then. 🙂 When you reheat it, it softens again. Yum. Fresh polenta is so much better than the log kind! Made this tonight with lamb sausage. Sauteed the Farro in a little butter and chicken stock for about 8 minutes. B4 adding to the stew pot. Also added 2 cups of stock to make it more of a thick, hearty soup. It was delicious, with fresh made honey lavash. Thank you for sharing the idea!!! Sarah: So glad you liked this dish! Your changes sound deeeelicious!! Oh I also added fresh peas, yumm!!!!! That stuff is just plain NASTY and I too LOVE polenta. Try cooking it as normal, add cheese and a little butter at the end. Then take a square heat resistant dish and pour it in. Wet your hands and pat it flat.